Photos by Brandon Macz: Candi Nicholson opened her first Club Pilates in Queen Anne last year. She recently opened a second in South Lake Union. Each Club Pilates studio comes with 12 exercise stations. Queen Anne resident Candi Nicholson began looking into franchises after losing her position at Nordstrom. Following a trip to Los Angeles in 2016 to learn what Club Pilates had to offer, she bought a package of three. “I took pilates privately for a couple of years, but I took it for a couple of years in the ‘90s, and it was incredibly expensive,” Nicholson said. What attracted her to Club Pilates was its more affordable group classes and fusion of pilates with TRX, Barre, springboard, cardio and other exercises. 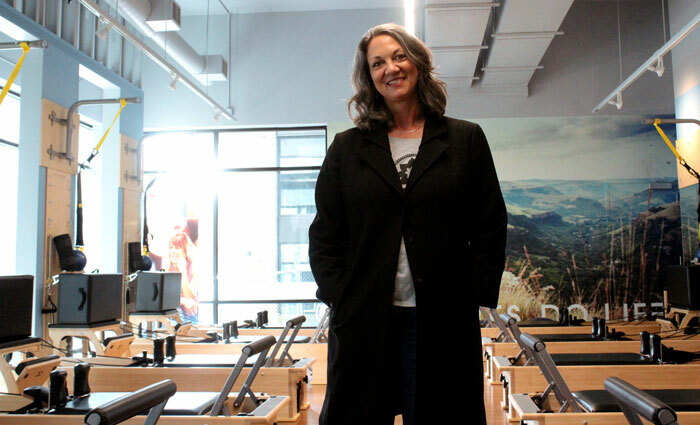 “There’s probably a thousand different exercises you can do with this equipment,” Nicholson said from inside her Queen Anne studio, which opened a year ago at 124 Denny Way. Nicholson recently opened her second location in South Lake Union, 425 Fairview Ave. N., which will have a grand opening from May 3-5. She’s now looking for a third Club Pilates space in North Seattle, possibly in Wallingford, University Village or Greenlake. Private pilates classes can cost $85-$100, Nicholson said, while Club Pilates classes are about $30 when broken down. People are encouraged to sign up for a three-month membership, choosing a package of four, eight or unlimited monthly classes. There is also a prepaid annual membership option. Each class has 12 stations for club members, who can check the schedule and book their times using a Club Pilates mobile app. Most members will gravitate toward a certain trainer, Nicholson said. Club Pilates requires its instructors to undergo a 500-hour training. “Really the instructors are the stars of the show,” Nicholson said. 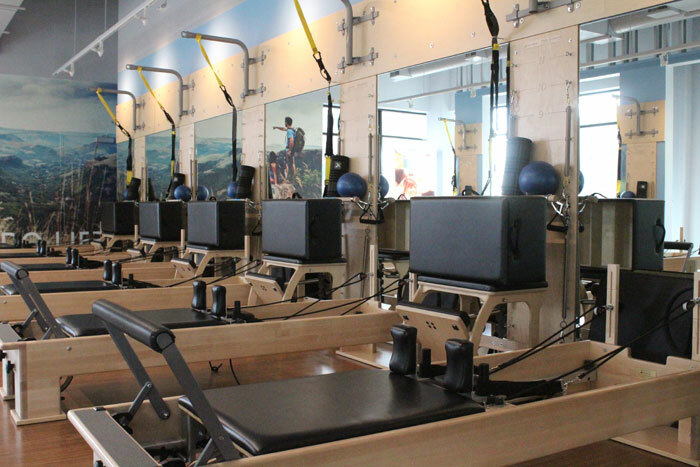 There are four levels of difficulty at Club Pilates, with 2.5 being the hardest. The introductory Level 1 Foundation classes are best for those just starting out and who may not be familiar with all of the equipment. Nicholson said she’s happy to have been the first franchisee to open in the Seattle market, and the hardest part of opening her studios has been finding the real estate. Nailing down her first space took so long that she went back to work, taking a job as a senior advertising campaign manager for Amazon Web Services. Her sister moved up from Fort Collins, Colorado, to help run the Queen Anne studio. 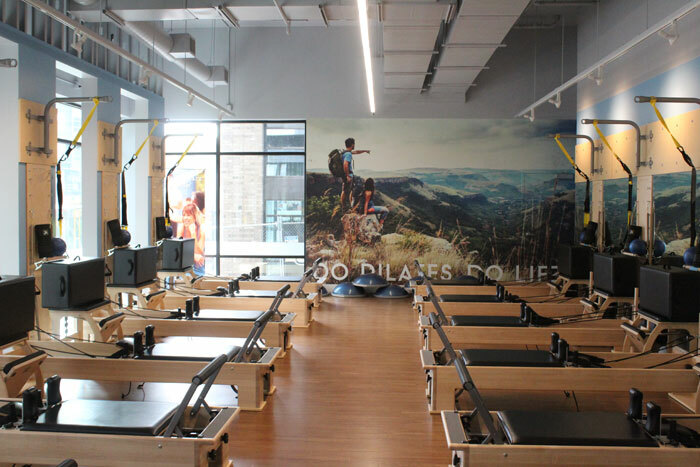 Claire Durrell, who previously owned her own fitness company, will be general manager for the SLU Club Pilates, which has seen a little more than 100 members join since its soft opening on March 28. Nicholson had four offers fall through before finding her SLU location, between a MOTION and Row House fitness studio. An added benefit for Queen Anne Club Pilates members is that the resident fitness center in the Broadstone Clarendon building is also available for exercising, Nicholson said. Learn more at clubpilates.com/queenanne or clubpilates.com/southlakeunion.